Wop St. Bass Ritual performs at Battle of the Bands. The group will make their Dillo Day debut Saturday. 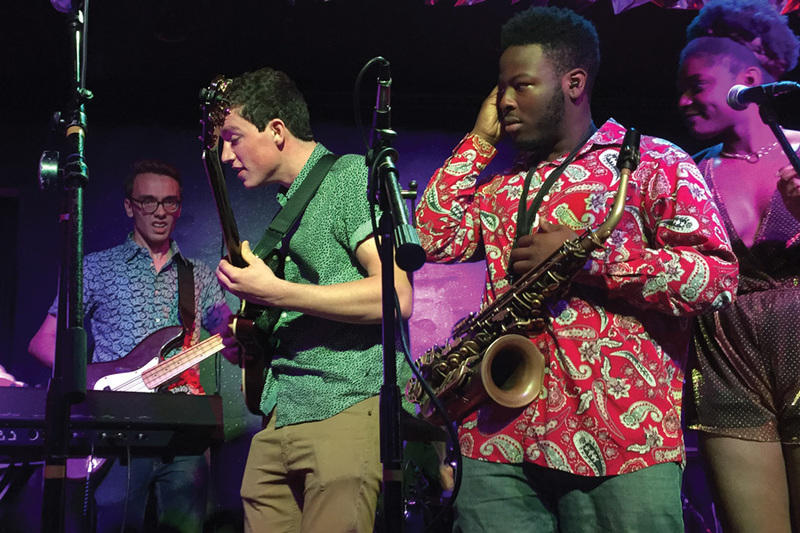 Last Thursday, six Northwestern student bands took the Evanston Rocks stage to battle for a spot in the Dillo Day lineup. The set list ranged from rap to indie rock, but Wop St. Bass Ritual’s funk tunes ultimately took first place. The Daily sat down with four members of the group — Bienen and Weinberg freshman Jacob Galdes, Bienen freshman Joseph Miller, Bienen freshman Oliver Holden-Moses and Bienen sophomore George Estey — to talk about their style and passion for performing. The Daily: How did you decide on your setlist for Battle of the Bands? Galdes: We tried to pick songs that people wouldn’t expect. As Oliver says, the mark of a good cover is one that people wouldn’t expect. If you’re playing a song and everyone’s like, “Of course they played that song,” then you’re not going to get any crowd reaction out of it. But if someone’s like, “Oh, I love that song, but I never would have thought they would play that” — that’s what we’re going for with our set. The Daily: How did vocalist Ogi Ifediora add to your stage presence? Miller: She added sensuality, smoothness, even a sense of expertise because the way she sings … not everybody can do that, you know? The way she does it is just so natural to her. I also say singers bring something that the audience can connect to, because every human has a voice. Bringing her on was a huge asset to us and a good reason why we went through because we blended so well together with her, and she sounded so great. The Daily: How was Battle of the Bands different from your past performances? Estey: It’s the first time, personally, that I’ve had an insane amount of people just screaming at me from the audience, which is an amazing feeling. The Daily: What sets Wop St. Bass Ritual apart from other student bands? Galdes: I think it’s the fact that we all love to improvise, and improvisation is part of every time we play. Playing rock, there isn’t much improvisation, you just kinda do what you’re doing, but in every song, we set aside a section where someone can improvise. Maybe Joseph’s going to take a solo, and we don’t know what he’s going to do. We don’t know where he’s going to take the feel or how things are going to change. So I think that’s something that sets us apart, in that everything we’re playing adds something new. It’s new to the audience, and it’s new to us too. The Daily: How are you feeling about Dillo Day? Holden-Moses: It’s a chance to make people have a good time and make people dance. Miller: Playing for a bigger audience will be a lot of fun, and playing on the lakefill, the setting is nice too. We’re at the same event as some great performers, so being a part of that is super great. Dillo Day is going to open up with a bang, so please be there or be square.